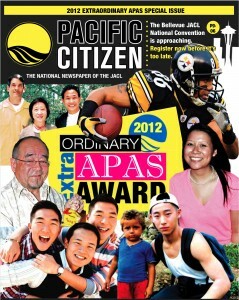 Director, Lead Actor, and Executive Producer receive an award from the Pacific Citizen. Check out the article with an exclusive interview with Director Jeffrey Gee Chin, Lead Actor Chris Tashima, and Executive Producer Fumiko Carole Fujita. Your contribution will enable us to preserve this piece of Japanese American history for generations to come. Join us and be a part of the legacy – there are donation levels for every budget. 120 Judge John Aiso St.
© 2014 Lil Tokyo Reporter Film, LLC. All Rights Reserved.